Three students at Mater Academy Charter High School were recently accepted to Wellesley College, a prestigious private university in Massachusetts. The three seniors (pictured above), Sophia Saco, Stephanie Consuegra and Annabella Gonzalez and are also friends. “We want to study different things but we all relate,” explains Stephanie. All three are Hispanic and first generation Cuban-Americans who have achieved academically while juggling a long list of extracurricular activities, from student government to dance, poetry slam to National Honor Society. The three of them will also graduate from high school this May having already earned a two-year college degree from Miami Dade College, thanks to Mater Academy’s progressive dual enrollment program. The girls put Wellesley first on their list of colleges to apply to – reaching beyond what’s familiar, and beyond state lines. 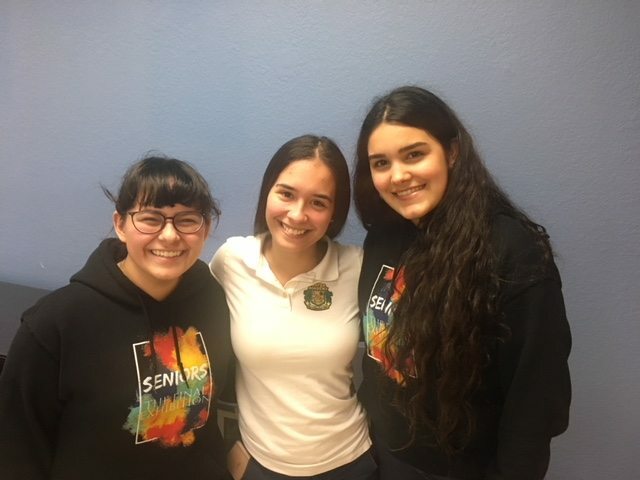 Stephanie, Sophie and Annabella say Mater Academy alumnus, and friend, Dayme Delgado who is now at MIT, inspired them to apply to their dream college. Mater’s unofficial motto: it’s not if you’re going to college, but where are you going to college, and their CAP advisor, Silvina Macho, also inspired them. “You grow up thinking about where you’re going to go to college and pushed to go beyond your comfort zone… that’s the Mater way,” explains Annabella. These young women are a determined crew – focused on not only going to college but on going to a college that best fits their interests and future plans. They are a product of quality school choice and now they’re exercising their choice when selecting a university. In the fall, Stephanie, Annabella and Sophie will be at Wellesley. They are aware of the challenges ahead and the great responsibility they have to represent their school, and other girls just like them back home. “You don’t have to just be the little brown girl going to Wellesley. You can be the little brown girl going to Wellesley that inspires other girls,” explains Sophie. There’s no doubt these dynamic women are up for that challenge. About Mater Academy: In 2016, Mater Academy Charter High School was rated among the most equitable schools in the nation by Education Cities and GreatSchools for closing or reducing the Achievement Gap for economically disadvantaged students. The school’s graduation rate of 98% far exceeds state and national averages, particularly among Hispanic students, which comprise the majority of Mater’s student body. Over 180 students of the Class of 2017 graduated with a GPA above 4.0 and 87 students also graduated having earned a 2-year college degree thanks to the school’s progressive dual enrollment program. Nationally ranked as one of the “Best High Schools in America” by U.S. News and World Report, Newsweek Magazine and the Washington Post, Mater Academy is also an “Inspiration Award” recipient (2016) — a CollegeBoard recognition for being among the top three most inspiring school in the country. The school is located at 7901 NW 103 Street in Hialeah Gardens, FL (Miami-Dade County).